All throughout July, I participated in a Pinterest/Instagram/Twitter photo project called #dailybookpic. Proposed by Cassandra Neace of Indie Reader Houston* and BookRiot, the daily prompts ranged from current read to reading glasses to book fetish to did not finish. I was thrilled to make several of BookRiot’s daily lists of featured photos (I had seven photos chosen, to be precise). I also used the different uploads on Pinterest and Instagram in order to publish outtakes of each day’s photos (although I have to admit, I still don’t really like Instagram). Sometimes the serendipity of the day’s assignment and whatever was going on in my life was spooky. On July 11, for example, the prompt was new release, and that very same day I just happened to win a copy of Cheryl Strayed’s new book Tiny Beautiful Things from BookPeople. 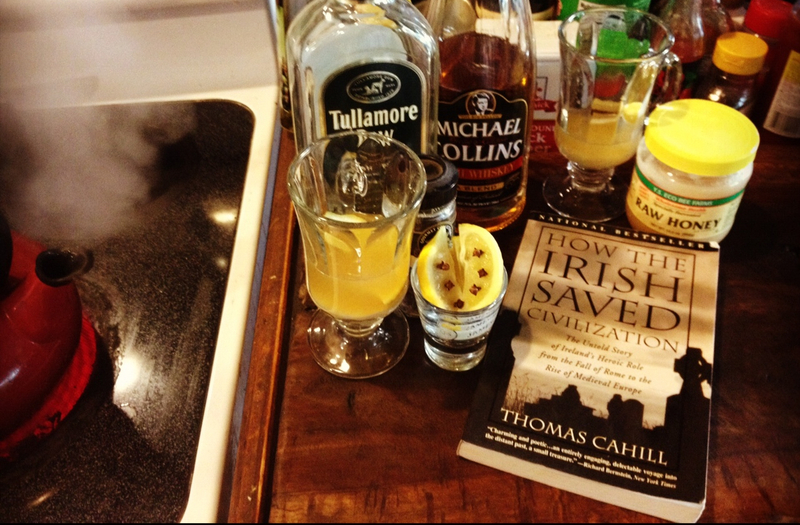 I think my favorite photo – and I’m not just saying so because this blog has an Irish theme – is my book and beverage photo (July 6). My boyfriend got strep throat over the Independence holiday, and only let me coddle him when I promised there would be whiskey involved. I made us some hot toddies with two types of whiskey (Tullamore Dew and Michael Collins), raw honey, cloves, and lemon, and told himself to pick out a book so I could stage my #dailybookpic photo. Darling that he is, he chose the copy of How the Irish Saved Civilization that he gave me before my trip to Ireland eight years ago. *I think she is changing the name of her blog soon… to Houston Reader.